My local paper, The Oregonian, did a write up last week on peanut butter and which brands reigned supreme. Just in case your wondering, Skippy took top honors for its “spreadability” factor, appetizing rich-brown color and its rich peanut taste complimented with just the right amount of salt. Anyway, along with the peanut butter tasting awards, were two favorite recipes from two of the Oregonian’s contributing writers. One is a Cook’s Illustrated recipe and the other is a beloved Grandma’s recipe, tweaked many times over the years. I do have a freakish-weakness for peanut butter, as well as cookies. This first recipe comes from Kym Pokorny, Homes & Gardens writer for The Oregonian. Overall, this is a really nice recipe. It has a great peanut taste with just the right amount of sweetness. It makes A LOT of ”big” cookies, at least 60. They are thick and perfectly sized for bake sales, church functions, parties and after school snacks. No one would be disappointed with this cookie. It’s a must try. They are disappearing quickly over here. Preheat oven to 375o F. In a very large bowl, whisk together flour, salt, baking soda and baking powder. In a small bowl, beat eggs thoroughly and blend in vanilla. In a large mixing bowl, briefly beat butter or shortening until fluffy, then gradually beat in peanut butter, then 2 cups sugar and the brown sugar. Beat well. Add beaten egg and vanilla mixture a little bit at a time, then gradually add flour mixture and incorporate well. The batter will be a little crumbly. Place the remaining 1/2 cup sugar in a small bowl. Roll dough into 1-1/2″ balls (these are big). Roll each ball in sugar and place 2″ apart on an ungreased cookie sheet. Flatten each ball with a dinner fork dipped in cold water to make a crisscross pattern (be gentle as the dough is crumbly). Bake 10 to 11 minutes or until brown. Remove from oven and allow to cool 4 to 5 minutes before moving from baking sheet to a wire rack. Now that is what I call a nice sized cookie! Sounds great and will try it next time I bake a batch of cookies. After my final chemo next week, I want to start back to baking and cooking your recipes! 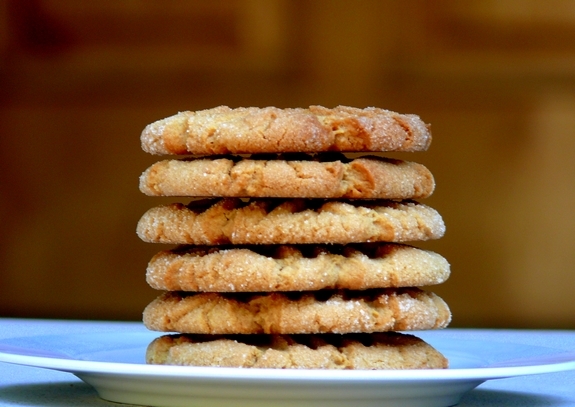 I have not had an appetite for the past 8 months, and I also need to put on some weight again…..so these peanut butter cookies look just like what the doctor ordered! I’m a Jif girl, myself. Whatever peanut butter, though, those cookies look mighty fine! They were always faves in my kids’ lunch boxes! Had to have fork crosshatches! Those look divine. Mmmmm. I’m a Kraft peanut butter girl for what it’s worth. my cookie batter was moist, and didn’t come out crumbly as the recipe indicates…but the cookies are just as picture perfect, and taste good too! thx! These sound wonderful…because it can make such a flavor difference, though, I wondered if you ended up using the butter or shortening to prepare these? I must say, I am a fan of PB cookies but my favorite recipe of all time is also the most simple to make. Mix. Bake at 350 until golden. Devour. This is my favorite because I’m not as fond of the “cake” style PB cookies which is what most are when they contain too much flour.